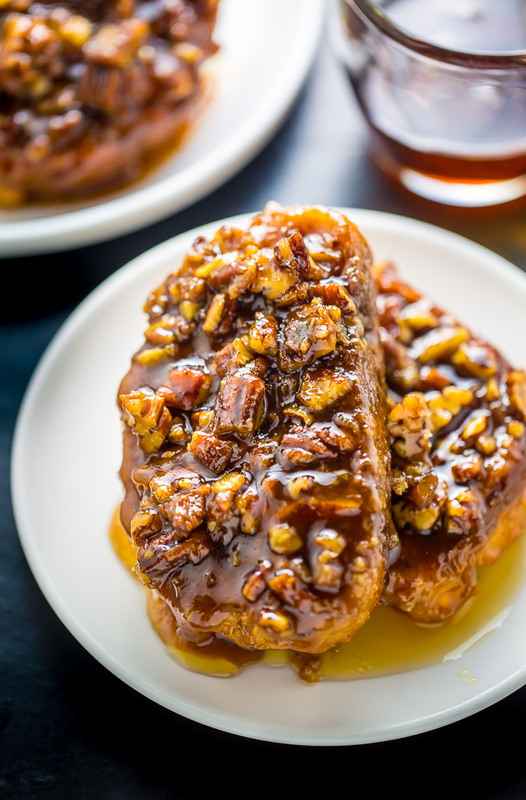 An easy and absolutely delicious recipe for Overnight Pecan Pie French Toast! Happy Friday! The weekend is just hours away and you know what that means, right?! BRUNCH. AKA the best meal in the entire world. 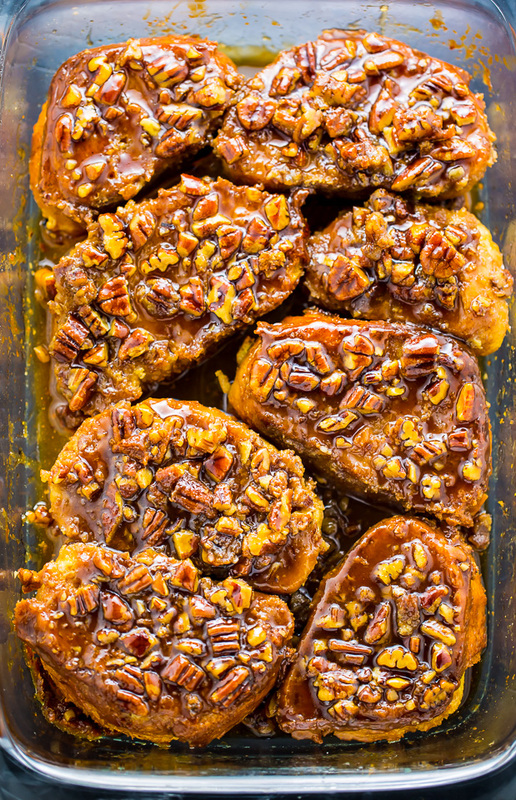 3 of my girlfriends are in town for the weekend and I can’t wait to surprise them with this overnight pecan pie french toast on Saturday morning. This is the ultimate holiday brunch recipe!!! It’s super easy, super impressive, and – of course – super delicious. It also goes great with mimosas and coffee, which are both brunch essentials in my opinion! 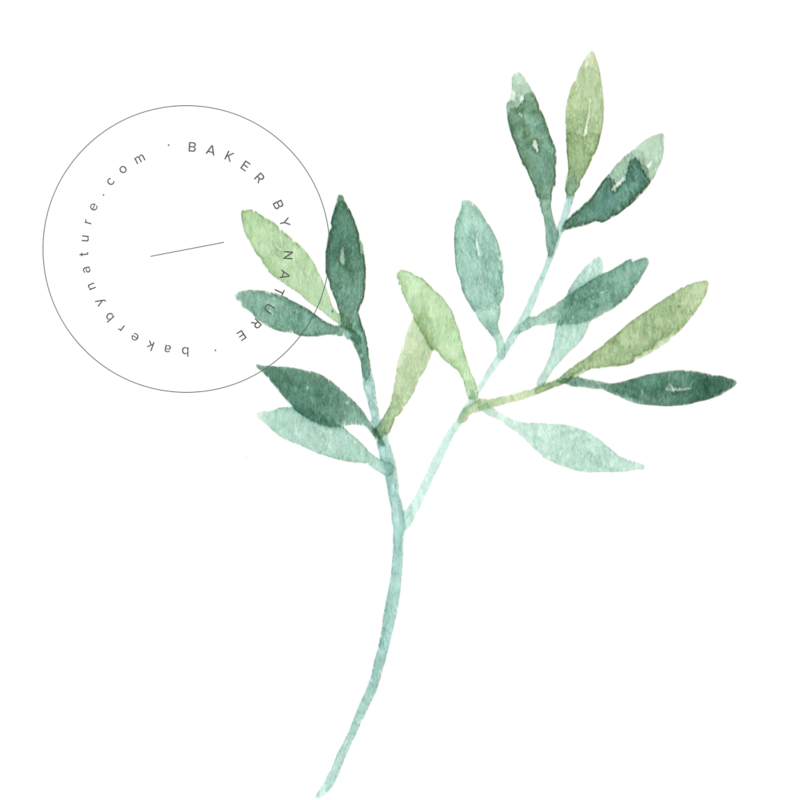 Let’s talk about ingredients. 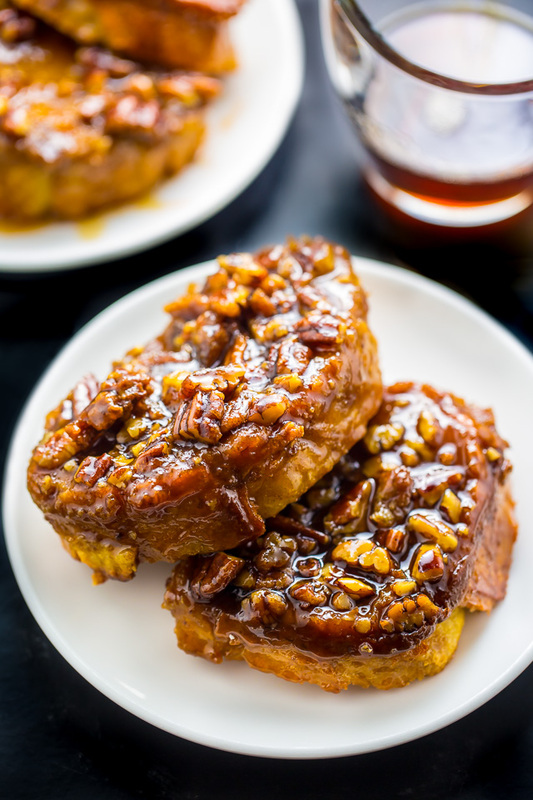 To make this overnight pecan pie french toast you’ll need: french bread, milk, heavy cream, eggs, vanilla, brown sugar, maple syrup, corn syrup, and pecans. You should be able to easily find all of these ingredients at your local grocery store, and with any luck… you may already have them in your kitchen! The french bread is soaked in a vanilla cream mixture overnight which provides incredible taste and texture. Once it’s soaked overnight you’ll coat your baking dish in butter, brown sugar, maple syrup, and pecans! As the french toast bakes, one side becomes encrusted with the pecans while the other side slowly caramelizes… it’s so dreamy! What I really love about this recipe is how perfect it is for sharing. Once it comes out of the oven, it’s ready to go. You don’t even need to serve it with syrup! It’s 100% sweet enough on its own. I highly suggest using French bread for this recipe, however if you cannot find it, brioche would be a good substitute. I don’t recommend using sandwich bread, since it’s very thin and may become soggy as it soaks overnight. You can make 90% of this recipe ahead of time, which is perfect for busy hosts. 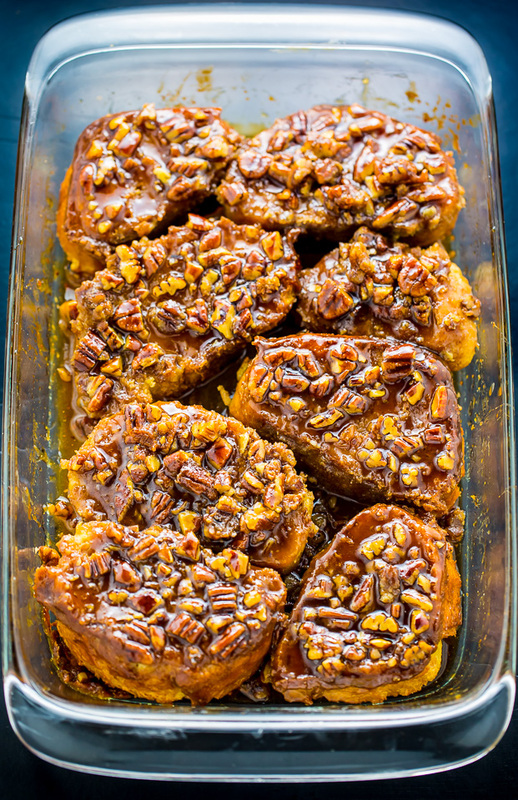 OXO’s Glass 3 Qt Baking Dish with Lid is perfect for this recipe! The super sturdy raised lid makes it easy to assemble and store stress free. I’ve been using this dish for everything from french toast to sheet cake to lasagna! I can’t tell you how many times I tried wrapping a dish with foil only to find something in my fridge fell on top and ruined the presentation. OXO was kind enough to send me their 14 Piece Glass Bake, Serve & Store Set and I use it every single day! It’s perfect for holiday cooking, baking, and gifting! You’ll want to soak the bread in a large, shallow bowl OR you can use a second 3 Qt baking dish, which is what I did. It’s very important that the bread isn’t overlapping as it soaks and that each piece is covered in the vanilla cream mixture. For a genuine pecan pie flavor, I suggest using maple syrup and corn syrup. That said, if you only have one on hand, you may use ALL corn syrup or ALL maple syrup. Once baked, this overnight pecan pie french toast is best served right away. However it will keep, covered tightly in the fridge, for up to 3 days. For an extremely decadent treat, serve with vanilla ice cream or a dollop of whipped cream! If you try this Overnight Pecan Pie French Toast, let me know! Leave a comment below and don’t forget to snap a pic and tag it #bakerbynature and #holidaybakingbonanza on instagram! 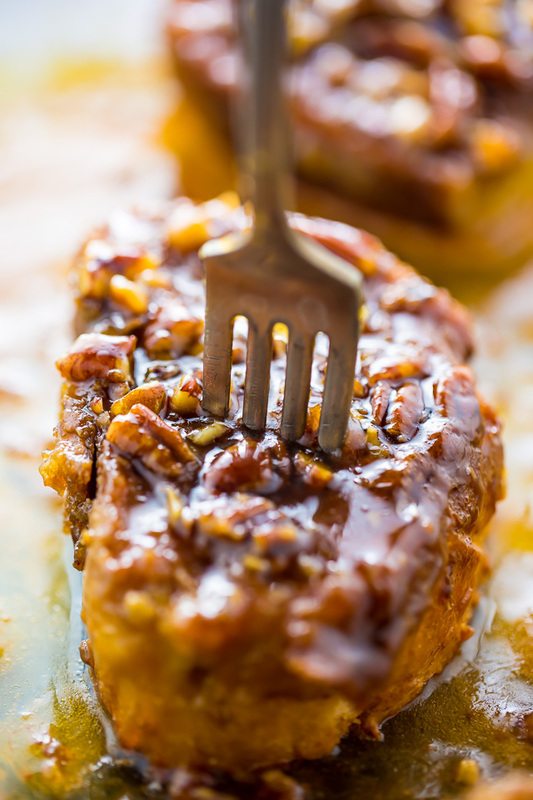 A super easy recipe for Overnight Pecan Pie French Toast! In a large bowl combine the milk, cream, eggs, yolks, and vanilla, beat well and set aside. Arrange sliced bread in a large shallow bowl. Pour the liquid mixture over the bread. Cover tightly with plastic wrap and refrigerate for at least 6 hours, or overnight. Since the pecans are placed on the bottom of the baking dish, do you flip each piece over once it’s taken out of the oven so the pecans are on top for serving? Wow, I did not know I needed this in my life so much, will be trying soon! What do you mean the top side is carmelized? The sugar mix is on the bottom. Did you pour the whole mixure on the soaked bread or turn it over onto the sugar/butter/syrup? Holy cow this was SO good. Your gorgeous photos convinced me to make it and I’m so glad I did!!! This sounds like such an incredible breakfast! Perfect for fall! Looks wonderful! Great pictures too. Could I leave the corn syrup out to make this more healthy? And if I did, what would I substitute in it’s place? You can disregard my question, as I found the answerin this article that tells what to substitute for corn syrup. If anyone is interested here is the link: http://www.epicurious.com/expert-advice/how-to-substitute-corn-syrup-article Thanks for this great recipe. Can’t wait to try it ! 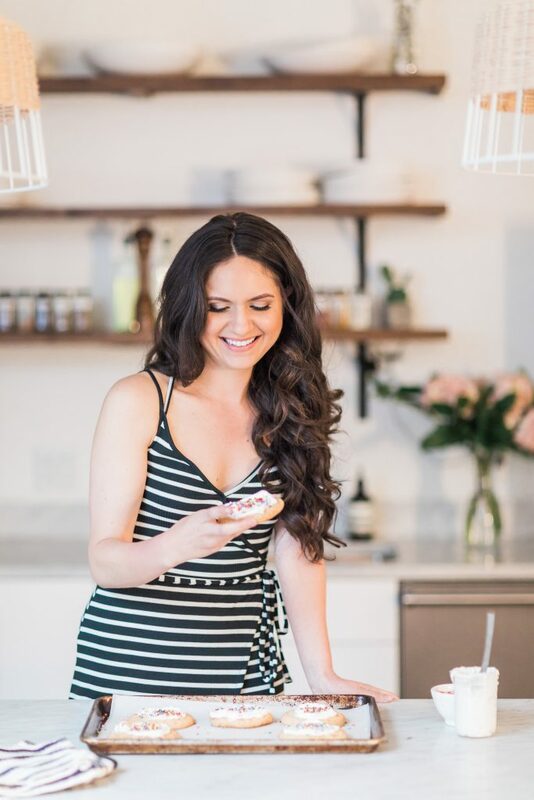 That’s a killer recipe Ashley! You nailed it. It looks delicious. Can’t wait to give a try! GIRL. This french toast is the french toast to end all others!!! I love the pecan pie spin, pinninggg! Amazing! Will be making it a second time for brunch with girlfriends. This reminds me of the cinnamon rolls we used to have in the bakery I worked in years ago. They were so good and this looks scrumptious! Do you think stale croissants would work? Great recipe, Ashley. Our family made this last night and it came out great! I wouldn’t change a thing. The family LIVES it! How big of a loaf of French bread are you using? I bought a 1 lb loaf and it’s rather long, so the slices would be really thick if I cut it into eight pieces. How thick are the slices supposed to be? My loaf was about 12 inches long, and quite thick. My slices were about 1 and 1/2 inches each.